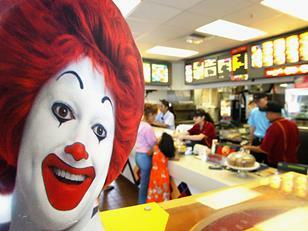 Woman Behind The Counter: Welcome to McDonald’s. How can I help you? Woman: (with a quizzical, mildly amused look) Uhmm. How can I help you? Woman: (in a sacchariney sweet “oh, I get it, your trying to be funny and I’m trying to get through the day without choking a customer” voice) Ha. No sir, we don’t have antlers? Would you like a Quarter Pounder? Me: (I swear, I’m trying to say “water”) Antlers…antlers, antlers…..aaaaaanttttlers. Woman: (losing patience) Sir, we do not have antlers? What is it that you…. Me: (I have lost any control of my tone) ANTLERS!!!!!!!! Woman: (looking frightened) Uhm. Sir, are you okay? Me: Antlers? Antlers! Antlersantlersantlersantlers!!! ANT-LERS!!!!! Woman: (near tears) Sir, I’m going to have to go get the manager. I don’t understand…..
Me: Antlers!!!!! What part of antlers do you not understand???? ANTLERS!!!! Me: (Turning towards the gathering crowd behind me) Antlers!!!! All I want are some antlers! Antlers! I’m thirsty!!! Don’t you understand! Antlers!!!! Anyone….please!!!! A large man in the line: (helpfully) Are you okay? Do you need some….assistance?? Me: I asked for antlers! Not a difficult request! Antlers! Antlers! Antlers! Am I not speaking English or something? An elderly woman behind me in line: (slowly dipping her hand in her purse for either mace or a cellphone) I think that you are confused. Antlers are things that are on a deer’s head? Her husband: Or an elk. Or a caribou. Or a…..
Me: Listen you ignorant mongrel! I came in here, I asked politely for antlers and these people are acting like I’m crazy. ANTLERS!!! You are trying to confuse me, but I’m not confused. I’m as clearheaded as I have ever been IN MY ENTIRE LIFE. I was born in New Rochelle Hospital! My mom’s maiden name is Czechlowski! I have green eyes! The 18th President was Ulysses S. Grant! ANTLERS!!!! Manager: Sir, I’m going to have to ask…. Me: ANTLERS! Listen you burger flipping, fry shoveling fascist! I made a simple request. I asked for…. Manager: (sternly) You are going to have to…..
Me: NO!!! I will not be silent in the face of tyranny! I will not wilt in the face of oppression! I will not change my order!!! I will not stand mutely as you ignore my desideratum!!!! You will not press down upon my brow with this crown of French fries!!!! You will not crucify me upon an arch of gold!!!!!! Manager: (looking towards the kitchen) Somebody needs to call the police. CALL THE POLICE!!!! (looking at me) Sir, if you do not calm down you are going to be arrested. Please…CALM DOWN!!!! Me: Calm down!!! Don’t tell me to calm down. Don’t you understand!!! Antlers….you mindless chromosome deficient mongoloid! Antlers are all I wanted! ANTLERS!!!!! The world is falling apart! The ice caps are melting! Small microbes are currently circulating through this room AS WE SPEAK that have the power to kill us all! I just want some ANTLERS!!!! Manager: (trying to hold in his fury) Okay….OKAY….we don’t have any antlers? Is there anything….ANYTHING….else we can get you? This entry was posted on April 28, 2013, 12:16 PM and is filed under Existential Rambings. You can follow any responses to this entry through RSS 2.0. You can leave a response, or trackback from your own site. Orange you gonna clarify that? I was thinking of Ionesco’s plays “Rhiniceros” and “The Bald Soprano”. I used to think they were about something. Now, I realize it’s about antlers. It’s a shame that Ionesco is gone (Eugene, for those of you keeping score at home). I am trying to get his decaying corpse to write my autobiography. It is well known that most MacDonald’s, with the exception of those in Quebec, where it’s MacDonald, are embarrassed about their antlers (that’s why they push artificial chicken or pork products. They have no beef, just ask at Wendy’s [Wendy in Quebec]). Also, asking for water at a MacDonald’s would pollute your precious bodily fluids, contaminating any essence you have, so not a good idea to start with. Actually their chicken products are mostly antlers. That’s why they’re so crunchy. They are in season from July to October. If you get a batch outside of that stretch, they are quite gamey. Quebec is an illusion. A bad bit of saurkraut I had at dinner last night. Don’t trust anything they tell you. No, Quebec is not a good place for sauerkraut. Reality itself is too twisted, especially in bat country. And all he wanted was Antlers. People out there are crazy! This is why I don’t leave the house. Hm. Czechlowski. Is that Ukranian? It’s part Armenian, part cocker spaniel. Thanks! Pudding is a poor man’s cornflakes. Reminds me of my student days – pudding and beer … mmmmmmmmmmm …………. 39 cents? For just 99 cents your likeness will appear 200 hundred feet tall on a screen above downtown Las Vegas, Quebec. Just had a thought … don’t know if this is even in the realm of possibility, but it just occurred to me while my monkey was getting touched, and I could be entirely wrong in this, but with this fixation on antlers … could it simply be that you might actually just be horny? Freud would have thought so.